Quilting is a complicated form of art enabling lots of possibilities for expressing one’s creativity. Some of the most basic techniques include piecing, applique and free-motion quilting. Through piecing, you can achieve a particular design or pattern as you attach small pieces of fabric together. Some of the different types of piecing include English paper piecing and chain piecing. Applique is the technique that’s used for applying a piece of fabric directly to another one. Finally, free-motion quilting is exactly as it sounds, you are free to make your quilting project however you like. Quilts can be made from a very wide range of fabrics, from cotton to silk and denim. Especially useful for free motion quilting, a stitch regulator is rare to find and can be quite expensive but it can create evenly-spaced stitches. The stitch matches your speed when feeding the fabric and so, the machine keeps the stitches even. If producing large quilts with ease sounds good to you, a machine with a generously sized table can be the right solution for your needs. An extended table is usually an add-on for more expensive machines but it can boost your efficiency if you need to create lots of quilts. Some quilting machines can be very costly, like long arm quilting machines for example, but the good news is that you don’t really need to make a huge investment if you’re more of a casual quilter. There are lots of sewing machines that have good abilities for quilting and don’t cost a fortune. 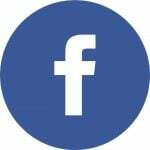 Your time is precious and to skip some tedious research, you will find in this article the best that the market has to offer in the quilting machines department. Choosing a suitable sewing machine for quilting can be difficult even if you’re more advanced but in here you can find the most cost-effective products. These machines are truly worth the money even if they are budget-friendly or premium workhorses. Giving you the flexibility to create more complex quilts and seeing as it’s fully packed with powerful features, the Brother HC1850 gets the top spot on this list. It’s designed to be simple-to-use and even though it’s so rich in terms of features, it’s a relatively portable device if you need to take it with you to classes. The price is incredibly competitive for what it offers, so this is definitely a standout sewing machine with quilting capabilities. This model has push-button stitch selectors and you can monitor your selection more clearly thanks to an LCD display screen that’s sufficiently bright. Speaking of brightness, this machine offers a LED-lit work area that’s ideal for adding the more difficult details for your project, even on darker fabrics. One of the reasons why this model is adequate for quilting is due to the wide table which nicely fits larger projects such as quilts. It will give you that extra space which you will most likely need if you want to be able to maneuver your project in a more comfortable way. Another useful accessory that will come in handy for quilting is the spring action quilting foot that Brother includes in the package for this unit. If free-motion quilting is something that interests you, this sewing machine has an excellent drop feed system which allows you to do that with more ease. The feed system allows you to sew on almost any fabric as it helps to move it smoothly and get more precise results in your formed stitches. Some of the other notable features include an automatic needle threader, a quick-set bobbin, and a flip-chart that contains all the built-in stitches and you can find it right on the machine. 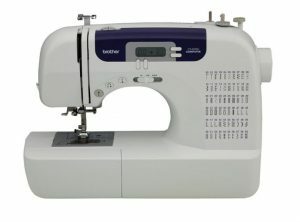 There are 130 unique built-in sewing stitches and 14 quilting stitch functions. 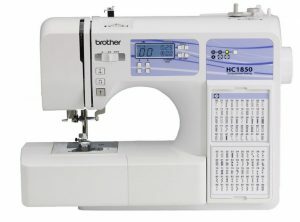 Considering how it simplifies the sewing and quilting processes and how performant is for the money, the Brother HC1850 is the top choice for a high-quality computerized sewing and quilting machine. Even if you’ve never used a computerized machine like this one before, you can still get it up-and-running in record time so this model is highly recommended for any quilting enthusiasts. 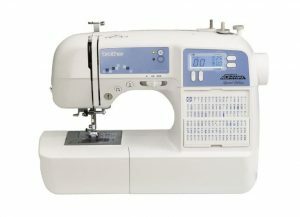 The Brother CS6000i is a value-packed machine that can handle a vast range of sewing and quilting projects. It comes with a few accessories which can be neatly stored inside a compartment found on the arm of the machine. This model is incredibly user-friendly and portable and it’s easier on your budget so that is why it deserves an entry on this list. Having the machine threaded is not very difficult as you can simply follow the numbered diagram conveniently printed on the machine. There’s also a printed diagram that shows you exactly where to put the thread making the bobbin winding process a breeze. Brother integrated an automatic needle threader which will push the thread through the needle with just a touch of the lever on the side of the sewing machine. With the help of an oversized table, projects that demand more space, such as quilts, will benefit tremendously. You will obtain the much-needed work area for maneuvering your project more easily during stitching. As this is a more budget-friendly machine, there are only 60 built-in stitches for sewing and that includes 7 styles of one-step buttonholes, 6 heirloom stitches, 20 stitches for garment construction and 20 decorative stitches. A total of 7 quilting stitches should suffice for most quilting projects. As this sewing machine is designed with automatic functions to simplify the work of any crafting enthusiast, you can enjoy creating various quilts, clothing, and accessories that match your style. Beginners and experienced quilters are sure to appreciate this model thanks to the oversized table but also because of the quilting foot. The latter allows for more accurate placement of the stitches for quilting and if you aren’t sure about something, you can always check the handy quilting guide included in the package. 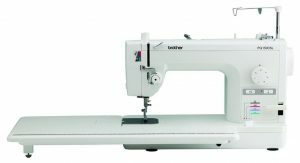 When you take into account the price which is actually very low for what this sewing machine can do, it becomes pretty obvious that the Brother CS6000i is worth the money. It can handle somewhere around 90% of your projects and it’s so lightweight and easy to use even for a beginner. There’s a decent variety of stitches and presser foots so all in all, this machine is recommended for any quilters who don’t want to spend a fortune to bring their creative projects to life. With many added improvements, the Juki TL2000Qi is a very capable quilting and home decor machine. It provides an incredible speed of 1500 SPM and it has an aluminum die-cast frame that reduces vibrations during work. There are lots of features to be excited about in this machine though the price could be over the budget of most casual quilters. If you want to get more serious about your quilting projects, this is definitely the way to go. As this machine features an automatic thread trimmer device, it can simultaneously trim bobbin threads at the sewing end and trim the needle. Just a gentle push of a button is all it takes to use the thread trimming mechanism. This mechanism can also be activated with the help of a foot controller by pressing the heel side of it. It’s nice that it’s big enough and convenient to start and stop sewing. The speed control mechanism allows you very precise control as it’s operated by a microcomputer and it enables the machine to sew materials at pretty low speeds. This is great when dealing with heavyweight fabric and quilting as it offers accurate feed and excellent stitching. The even feed foot also helps in this regards as it ensures that the seams are perfect even in more difficult fabrics to feed. A quilting foot is integrated and it’s designed to simplify free motion quilting and can also come in handy for free-hand embroidery. By simply pressing a switch, you can raise or lower the feed dog. During quilting, the drop feed permits the sewing of curved stitches more efficiently. There’s a knee lifter lever for lowering or lifting the presser foot without having to use your hands and it can be raised as high as 12mm. 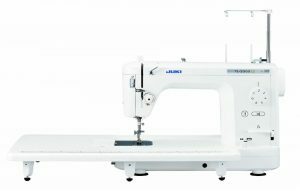 Considering that Juki includes an extension table for large work area, the TL-2000Qi sewing and quilting machine is recommended for the more demanding quilters. Because this workhorse comes with a fast stitching speed, a 1/5 inch quilting foot, an automatic needle threader and an even feed foot among many advanced features, it’s strongly recommended. 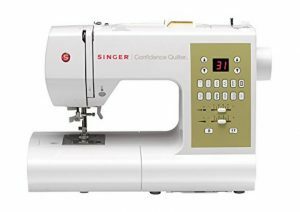 New and skilled quilters alike will be able to take advantage of the great features of the Singer 7469Q Confidence Quilter machine which embodies all the advanced features that someone with a medium budget can afford. For ultimate creativity, you have 98 stitch patterns at your disposal and some great accessories including quilting presser feet. The first thing you can probably notice about this machine is the heavy duty metal frame. It has a robust internal skeleton which holds all the mechanisms in alignment for skip-free sewing. The maximum sewing speed of this unit is 750 SPM which is great for the price, it allows you to get through projects very quickly. Managing quilts and other larger projects can be done more easily with the help of the extension table which expands the sewing surface available. Quilting feet also come as a bonus in the package to take your creativity to the next level. This machine stands out in terms of ease-of-use. Just press a button and select the stitch and then adjust the settings for length, width, pressure, balance, and tension. There are 98 built-in stitches to choose from, 77 decoratives, 8 essential, 6 stretch, and 7 buttonholes. If you are having troubles regarding how and when to use them, the guide from the instruction manual is very helpful for that. A feature that could be considered vital for quilters when piecing together patchworks is the programmable needle up and down. When appliqueing, quilting or pivoting fabric you need to select to get the needle to stop in the down position and when you remove the fabric from the machine, it’s important to raise the needle to the highest position. The large table and the four bonus quilting feet truly make for a great quilting combination and considering the cost of the Singer 7469Q Confidence Quilter, it’s safe to say that this machine is a winner on the market for computerized sewing and quilting machines. Overall, it does everything it advertises and you should not expect to have any issues with it so this unit is recommended for any crafting enthusiasts. 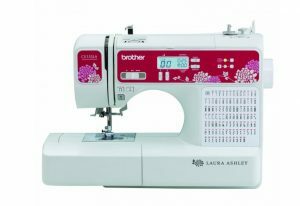 The Laura Ashley Limited Edition CX155LA is a great sewing machine from Brother that has some dedicated features for quilting and includes a built-in font for basic monogramming. It has a total of 155 built-in stitches and despite the performance and the high-quality of its features, it has an affordable price suitable for fulfilling your creative potential. For making custom designs, this model has 11 sewing and quilting feet and the included wide table will fit nicely some of the larger projects like king-sized quilts. Having a larger workspace is strongly recommended if you’re into quilting as the extra space will offer you a better way to maneuver the project. Like similarly-priced Brother sewing machines, this one comes with an LCD screen with good visibility to clearly adjust the stitch settings to your liking. With a touch of a button, you can select your stitch and see it on the convenient display. There’s a stitch speed slide lever which provides control over how slow or fast you want to work. In terms of performance, Brother equipped this unit with a powerful needle threading system that automatically pushes the thread through the needle with precision by touching the lever found on the side of the machine. The exclusive Quick-Set top-load, drop-in bobbin will guarantee that the bobbin stays firmly in place and delivers a good level of reliability for getting ideal stitch results every time. A perfect machine for lots of projects, this sewing and quilting machine will help you redecorate your home without having to spend money on store-bought pillows, curtains, and whatnot. It’s fun and easy to create unique home decorations by yourself if you use the right machine for the job. 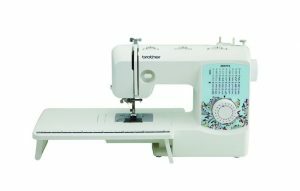 When you take into account the variety of stitches included and the nice additions for quilting, the Brother Laura Ashley Limited Edition XC155LA is worth every cent. It enables you to discover a treasure trove of creative possibilities. Due to the fact that this model comes with a larger table than its similarly-priced competitors, it’s especially recommended for quilters who enjoy working more comfortably. Ideal for working with problem fabrics, the Brother PQ1500SL is a very performant sewing machine with specialized quilting abilities capable of sewing up to 1,500 stitches per minute. It’s loaded with powerful features but it’s important to note that it’s a considerably more expensive machine than others on this list, destined for large-scale sewing jobs. Providing time-saving convenience, the automatic thread cutter is present in this machine and there’s also a thread tension dial. The pin feed mechanism enables you to change from using the feed dogs to relying on a single pin which cleanly extends from beneath the machine. It moves all layers of a quilt together and is capable of moving delicate materials like velvet without leaving feed dog marks. The construction of this unit is on par with what you’d expect at this price, solid and strong enough to withstand demanding projects with increased stability. Managing those larger projects usually means you need to have a good extension table and the one on this model is very good and also practical as it offers a bobbin case opening. The convenient access point removes the need to get the table out of the way when you want to replace the oversized metal bobbin. A nice feature of this machine is the knee lifter for quilting which allows you to lift the presser foot with your knee and you can use your free hands for the project more efficiently. For visibility and better fabric control, Brother integrated 4 color-coded levels of feed dog adjustment. Thanks to a dual thread stand, you can keep two thread spools ready. To get more consistent threading and more efficiently, use the thread spool extender. There are so many amazing features packed into this machine and it seems that Brother did an excellent job in designing the PQ1500S. The only downside is the price but if you want a sturdy and reliable machine that delivers the much-needed space and performance required for professional quilting, this one is a no-brainer. With 100 built-in varied stitches, the XR9500PRW Project Runway is another capable machine from Brother which delivers the superior level of quality that you can expect from the leader in sewing and quilting machines. This one is a good machine for embellishing pretty much everything, from home decor items to clothing and of course, it’s recommended for making some unique quilt designs. A large LCD screen can be found on this unit and it permits the user to select through various stitches and adjust the settings according to the project’s needs. You can try one of the built-in 55 alphanumeric stitches for basic monogramming or lettering. Thanks to an oversized table, the accommodation of big quilt projects is possible and something that can definitely be appreciated by those who go on special courses is the fact that it’s such a lightweight machine. Some of the additional features include a very simple-to-use bobbin winding system and a needle position button. Sewing cuffs (and sleeves) is more convenient with the help of the free arm. The work area is illuminated thanks to a powerful LED. Brother supplies many accessories to complete this value bundle. When it comes to feet, the machine comes with a buttonhole foot, zipper foot, button sewing foot, zigzag foot, overcasting foot, monogramming foot, and a blindstitch foot. Another accessory that’s worth mentioning is the pouch with various needles, bobbins, and many other helpful tools. A hardcover is included as well. Considering everything about the Brother XR9500PRW Project Runway, the final verdict leans on a very positive note. This machine is a wonder for advanced and beginners alike and it’s awesome that you can do basically everything you need with its help including designing some beautiful quilts. The LED lights are fairly bright but you will probably still need to use a bigger lamp. All in all, this model represents a solid product for the money. Brother dominates the market for quilting machines and the XR3774 is a powerful example of the advanced technologies incorporated by this manufacturer. It’s a solid sewing machine for versatile crafters though it only has 37 built-in stitches, which is decent though it doesn’t offer as many possibilities like some of the other machines. To select stitches with this machine you need to use the dial and turn it to the right stitch for your particular project. As with many advanced machines from Brother, this one too features an automatic threading system. Just press the lever on the side of the machine, and the thread gets pushed right through the needle. Brother’s exclusive Quick-Set top drop-in bobbin will keep the bobbin in place and can provide a more reliable stitch quality. One of the main attractions of this machine is the wide table provided for large quilting projects. Setting up the machine for the first time can be overwhelming for any beginners in the art of quilting but thankfully, Brother includes an instructional DVD which will help you get started right away. It offers clear demonstrations on every topic from threading the needle to sewing buttonholes. Something that can definitely be appreciated by all users of sewing machines is the lightweight of this machine. Due to the fact that it weighs just under 15 pounds, it can be a pretty convenient machine to move around as needed. The design of this machine is pretty solid, it doesn’t suffer from any notable problems in build quality. Taking into account the excellent stitching quality, the bright LED, the helpful instructions, and all the other automatic functions great for saving time, this is a very intuitive and straightforward machine for beginners. Any casual quilters could benefit a lot from this feature-rich machine which has an extremely reasonable price. Maybe the low amount of stitches could be a drawback but there are plenty of decorative options here for quilting so overall, it’s recommended.